The Eighth Commandment is recorded in Exodus 20:15: “You shall not steal.” The Bible describes many forms of stealing we must avoid. The Eighth Commandment helps us focus on how we view our neighbors, and digging deeper into Scripture helps us see that not stealing requires more than just not taking what doesn’t belong to us. Many human laws have been made to try to protect personal possessions and property from those who would seek to take them for themselves. But the intent of God's Eighth Commandment goes deeper. Stealing can take many forms, including cheating someone or even delaying paying someone what you owe him or her: “You shall not steal, nor deal falsely, nor lie to one another. … You shall not cheat your neighbor nor rob him. The wages of him who is hired shall not remain with you all night until morning” (Leviticus 19:11, 13). The apostle James strongly warned the wealthy people who oppressed their workers and the poor: “Your riches are corrupted, and your garments are moth-eaten. Your gold and silver are corroded, and their corrosion will be a witness against you and will eat your flesh like fire. You have heaped up treasure in the last days. Indeed the wages of the laborers who mowed your fields, which you kept back by fraud, cry out; and the cries of the reapers have reached the ears of the Lord of Sabaoth. You have lived on the earth in pleasure and luxury; you have fattened your hearts as in a day of slaughter” (James 5:2-5). Companies can attempt to steal from people with misleading advertising and shoddy products and services. Employees can steal from their employers by wasting time or doing personal things on company time. Lazy people can try to take advantage of the goodness of others, leading the apostle Paul to write: “For even when we were with you, we commanded you this: If anyone will not work, neither shall he eat. For we hear that there are some who walk among you in a disorderly manner, not working at all, but are busybodies. Now those who are such we command and exhort through our Lord Jesus Christ that they work in quietness and eat their own bread” (2 Thessalonians 3:10-12). 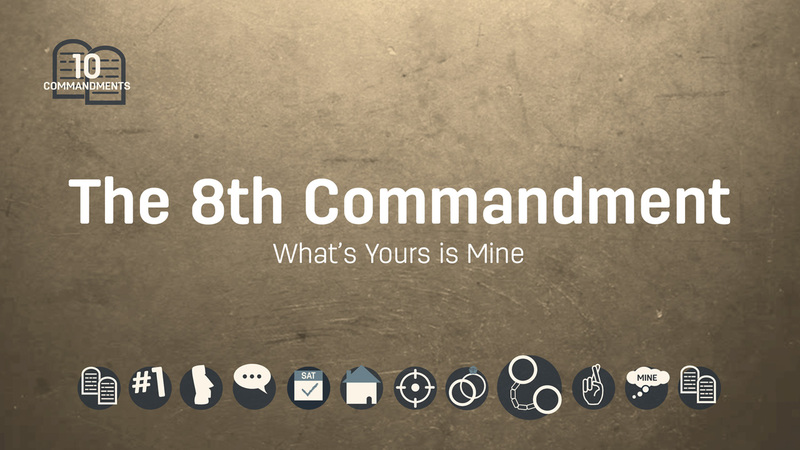 The Eighth Commandment protects personal property and teaches us to respect the property of others. More than that, in its spiritual intent it contrasts two ways of life: getting versus giving. The Eighth Commandment protects personal property and teaches us to respect the property of others. More than that, in its spiritual intent it contrasts two ways of life: getting versus giving. Consider how the apostle Paul describes the opposite of stealing: “Let him who stole steal no longer, but rather let him labor, working with his hands what is good, that he may have something to give him who has need” (Ephesians 4:28). “He answered and said to them, ‘He who has two tunics, let him give to him who has none; and he who has food, let him do likewise” (Luke 3:11). “Give to him who asks you, and from him who wants to borrow from you do not turn away” (Matthew 5:42). Jesus Christ summed up the benefits of God’s way of give this way: “It is more blessed to give than to receive” (Acts 20:35). “Who has preceded Me, that I should pay him? Everything under the heaven is Mine” (Job 41:11). “‘The silver is Mine, and the gold is Mine,’ says the LORD of hosts” (Haggai 2:8). It is to our benefit to remember that God is the source of every good gift that we have (James 1:17). So God allows us to enjoy His blessings, and He only asks that we acknowledge Him with a tenth (a tithe) of what He provides. “‘Will a man rob God? Yet you have robbed Me! But you say, “In what way have we robbed You?” In tithes and offerings. You are cursed with a curse, for you have robbed Me, even this whole nation. Bring all the tithes into the storehouse, that there may be food in My house, and try Me now in this,’ says the LORD of hosts, ‘if I will not open for you the windows of heaven and pour out for you such blessing that there will not be room enough to receive it’” (Malachi 3:8-10).